We believe growth happens in many different ways. It happens when we read and study the Bible. It happens when we pray. It happens when we listen to the sermons. It also happens when we get together to share stories from our faith journey. One thing for sure, we have to “feed” and nurture our faith for it to grow. Embury takes small groups seriously. We believe the faith growth doesn't happen during one hour on Sundays. 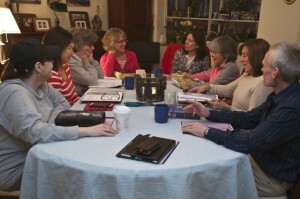 Small group provides a perfect vehicle by which we can grow - by way of studying the Bible and sharing faith experiences in an intimate setting. Small group meets Sundays after worship. If you haven't been part of a small group, you owe it to yourself to experience it. Contact: Hyun Hui Kim email hyunhuikim75@gmail.com.